York Cottage was a large two storey, three bay house in Kingston, immediately next door to the Duke of York public house. The house had a stucco front above road level with rusticated quoins and sash windows. In the 1948 Ministry of Town and Country Planning Provisional List of Buildings of Architectural Interest in the Yeovil Municipal Borough it was a Grade III building and the List noted that it had an "Elaborate mid-19th century metal trellis porch with design of vine leaves." 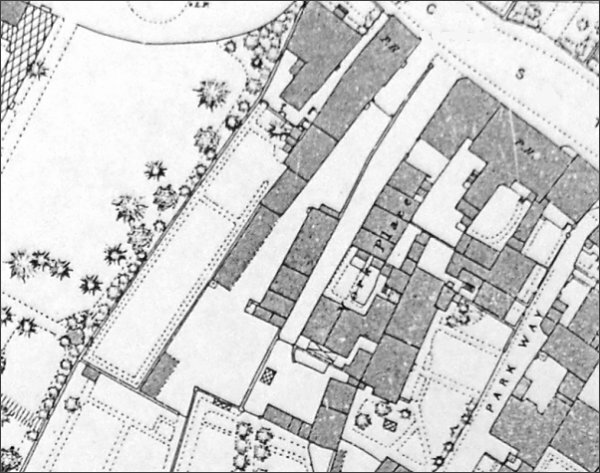 York Cottage is clearly shown on Day's map of Yeovil of 1831. It is difficult to tell who was living in York Cottage in the 1841 census, but the 1842 Tithe Award shows that Jane Newman was the owner and T Bullock was the occupier - neither of whom were living in Kingston in 1841. The following census in 1851 listed Elizabeth Bollen and her two children together with two lodgers and two visitors. In 1861 Elizabeth Bollen was joined by William Shorland, retired surgeon, and his wife Anna. Elizabeth Bollen was still in the house as an 82-year old in 1881, together with a domestic servant. In the 1891 census solicitor Albert Bollen was in residence - presumably Elizabeth's son and heir - and certainly an active solicitor in Yeovil during the 1880s. Albert lived with his sister Frances, together with a domestic servant and the servant's young daughter. Collin's Yeovil Directory of 1907 noted that York Cottage was the residence and office of solicitor PW Mayo. In 1919 Kelly's Directory listed George Frederick Munford, the Editor of the Western Gazette, as living in York Cottage. Snell's Directory of 1854-5 listed Robert R Dunston as the occupier. York Cottage was demolished in January 1967. This map, based on the 1886 Ordnance Survey, shows York Place just right of centre with Kingston in the top right corner. The long building marked 'PH' right of centre is the Duke of York and the rectangular building marked 'PH' at top right was the White Lion. York Cottage is the large building at top centre, next to the Duke of York.